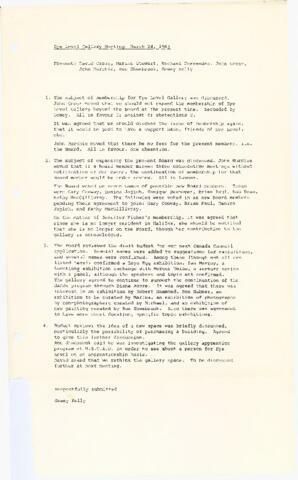 Item consists of meeting minutes from Eye Level Gallery on March 24, 1983. Members present included David Craig, Marina Stewart, Michael Fernandes, John Greer, John Murchie, Ron Shuebrook and Gemey Kelly. Issues related to the membership, board members, and budgets were discussed.